One of the joys of this summer is to have presided at my first weddings. The first was the fulfilment of a prophesy, at least for me, as having a vision of me officiating at my first wedding had been one clergy friend’s encouragement for me to seek selection for ordination! I am most grateful to Tarran Patterson, the photographer on the occasion, for snapping the photo here as I completed the registers without me being aware of it at all, so that I have a visual memory of the occasion. We are blessed at Old Basing with room for official photographers to take a few photos during the ceremony without intruding into proceedings at all, and she managed to do that brilliantly, which was a gift to a rooky priest. Today’s wedding was my last for this year. The bride will be ‘given away’ by her mother, as sadly her father died a few years ago, and is laid to rest in our churchyard. She asked to lay “his” button hole on his grave before she entered the church so he is included in the day, so I suggested that we not only do that, but we say a prayer as we do so. She, her sisters, and particularly her mother, seem very grateful for being able to ‘fill in the gap’ in this way. Loved ones are always more acutely missed on such occasions, especially when they would have otherwise fulfilled a special role. At my first wedding the bride paused at a siblings side when coming down the isle to give them the flower token that their daughter would have carried, had she survived infancy. Another lovely touch that it was easy to enable, and we also remembered the child by name in the prayers when acknowledging other deceased loved ones, parents again. When we rehearsed last night with this weeks couple, it was also decided that I would pray a blessing over the whole family, so that their children feel not only part of the occasion as bridesmaid and pageboys, but visibly included in God’s love in a special way too. Needless to say there’s not a standard prayer in Common Worship for either circumstance (that I could find anyway, as this is not a blended family) so it was time to turn to and write my own. With a little encouragement from Rev’d Ally who confirmed my use of language fitted with the tradition of my serving parish (my incumbent being away), I shall be using these on Friday (as this blog post goes up). the example of love that N shared with his family. that is at work in all our lives. Amen. Our parish churches and their ministers, have certain responsibilities. These include, as I understand it, the requirement to baptise, marry and bury those who request such ‘occasional offices’. It concerns what happens when a family from outside the parish approach a church requesting a funeral for a loved-one, because of some prior connection, most often previous residence and the fact a relative is already buried in the local churchyard or cemetery. For other occasional offices, contact is also established in some form with the family’s local church. With baptisms, permission is typically sought from their local parish church, and in some cases baptism preparation may take place there. With weddings, assuming banns are required, formal contact is also required between the couple and the place, or places they live. 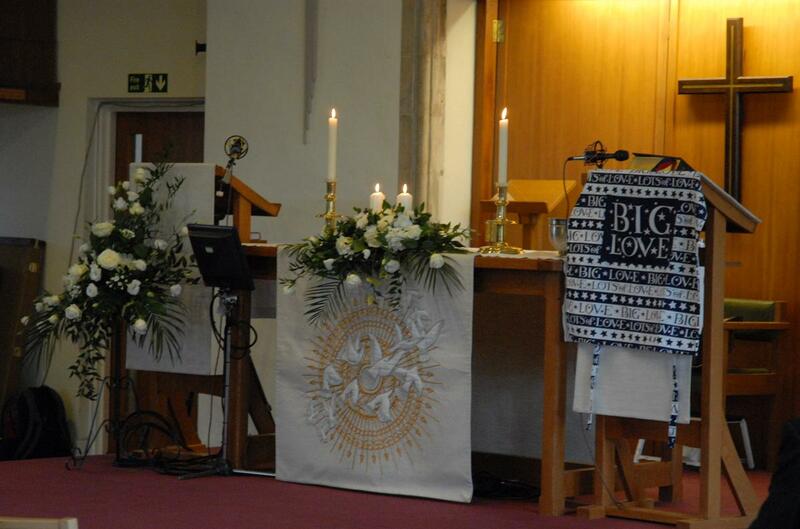 There is also an encouragement through the wedding project to seek the prayer support of the parish you live in. I am aware of no such tradition of missional contact with their parish of residence when families return to a community to have a relative buried; but do correct me if I’m wrong! So, I’m wondering if, with the family’s approval, it would be helpful and good practice, to contact the local parish or minister of grieving relatives, so that further bereavement support could be provided by the wider church, especially since it could prove difficult for your own parish and it’s pastoral team to follow through with such work? Otherwise, there may be a danger of leaving families isolated from other appropriate sources of Christian pastoral care, and as Christian ministers we may also be guilty of compromising our own missional capacity. Is this something that the current research project started last year by the Archbishop’s Council could, or should, consider? Yep, me signing the registers on my wedding day! Today I handed over the last of the administrative responsibilities I have accumulated over my recent years as a Reader at St Peter’s, Yateley: the administration of Banns of Marriage, reading of Banns, and writing of Banns Certificates, along with the writing of Marriage Registers and Certificates! In preparation I made some extensive notes for my successor which I happened to tweet about yesterday. The Vicar’s Wife asked me for a copy and suggested I blog it! So after our ‘hand-over’ session today, which our lovely vicar also wisely attended and added his wisdom to, below is a .pdf summary of what I’ve learnt, which I have hopefully de-localised so it might be of use to others. It is the accumulated ‘wisdom’ of several years undertaking administration connected with weddings at my local parish church, including those things I learnt during a year of vacancy during which I seemed to spend a lot of time talking to our Diocesan Registrar! However, this doesn’t make me an expert, so if you find you are told differently to any of what is attached by someone important and trustworthy, please trust them not me! There’s a lot of material in my old wedding dress! Among the old lecture notes, text books, guitar magazines, rolled up carpet off-cuts and cast off clothes, was one of the things which had precipitated this unusual behaviour. My wedding dress. Twenty years ago, and as our son pointed out in a rather slimmer period of my life, I was married in more yards of natural silk (and five net petticoats) than was probably sensible on a warm day in July. Since then, carefully folded into an old florist’s box, my wedding dress has lain hidden away. Interestingly although it sparked many reminiscences for both of us, my husband has almost more emotional attachment to it than I have. I guess I wasn’t looking at it from the outside, and it wasn’t me that played with pearls on the bodice during the Best Man’s speech when no-one was looking! 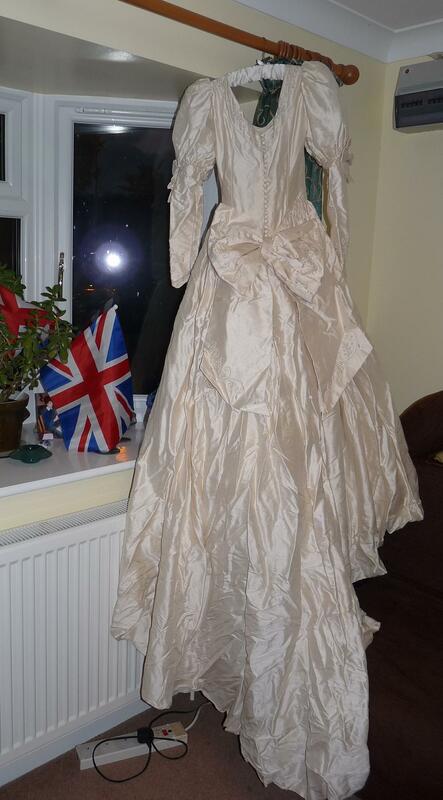 It looks in pretty good nick, though it seems a slightly darker shade of ivory than I remember it, and has some minor mould damage near its hem. I don’t have a daughter to hand it on to, and it will only deteriorate more if it returns to the loft, so now, it’s hanging, a little like the ghost of a Tudor lady, from the curtain rail of our spare room, awaiting its fate. 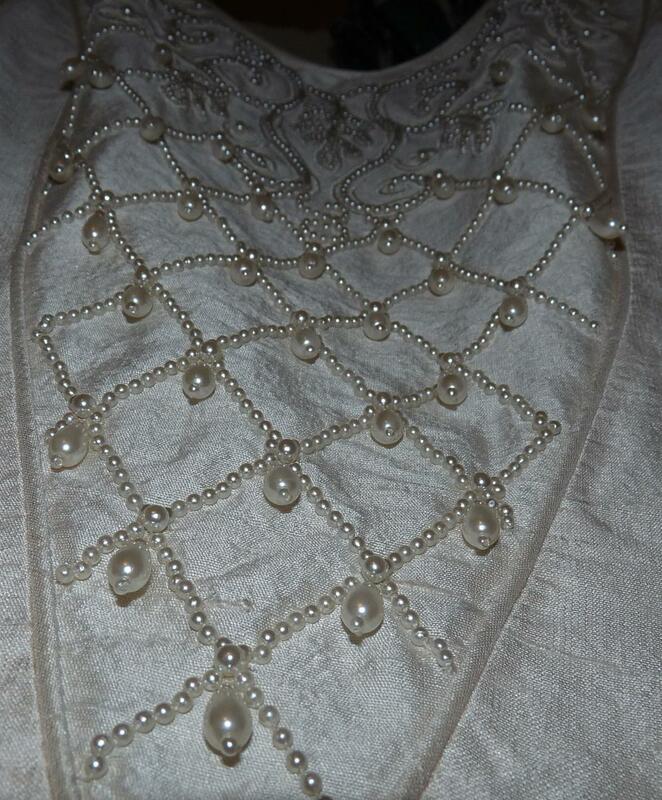 Husband dearest wants to have the bodice panel removed and framed for posterity, whilst I was thinking this would be rather easier with the bow at the back. We may need to compromise and achieve both in one frame, if we had the foggiest who might be able to do such a thing. For the last few months, in fact since before being recommended for ordination training, I have harboured the idea, inspired by snatches of conversation with others over the last couple of years, of using all that silk for making clerical stoles, or at least a ‘white’ one. White stoles are after all used by priests when taking weddings, and I can’t think of anything more appropriate than using my own wedding dress for that! 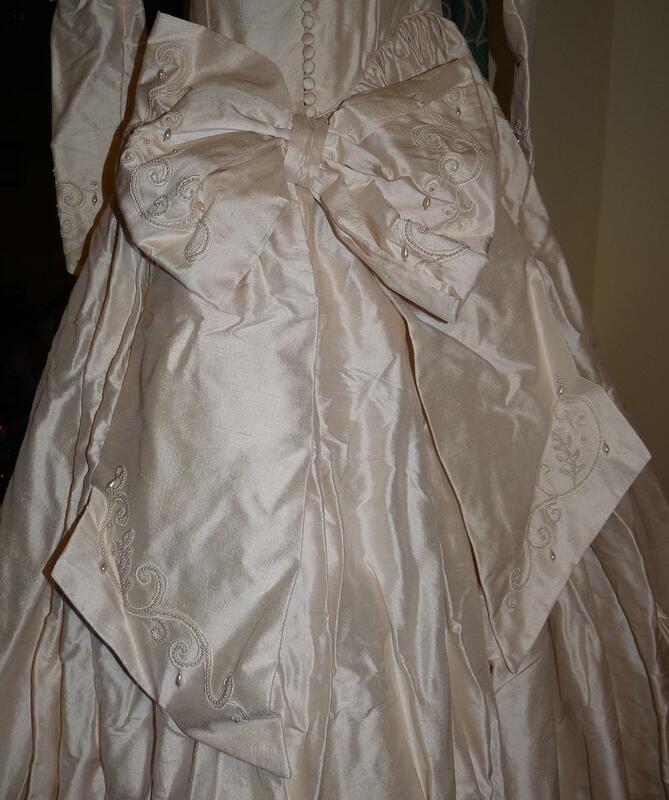 The bow at the back – in fact the ‘tails’ are sewn into the waistline, and the ‘bow’ is hooked over to hide the zip that ran below the buttons. I know I’ve got two years before I get as far as ordination, and there’s no certainty I’ll get there at all, but at least that’s time to work out if the idea is a runner. Could it be cut up to the right shape, or shapes? Is it suitable to be dyed? Is the material of the right sort? Could it be silk painted? What could be used to line and strengthen it? I’m not sure where to start, or even if the silk is pale enough for this to be appropriate, or anything really. 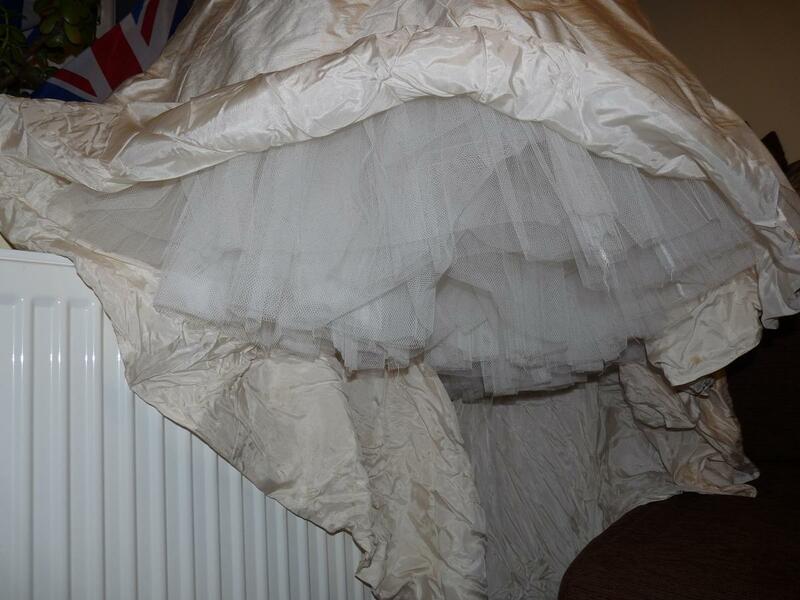 Then there’s all that netting that makes up the five petticoats. If we’re cannibalising the silk itself for various forms of posterity, could someone make use of all that netting? If anyone has any experience, wisdom, bright ideas or alternatively wants to give me a sanity check, now would be a great time to share it with me. Please. How can God’s “Big Love” get through the admin of weddings? 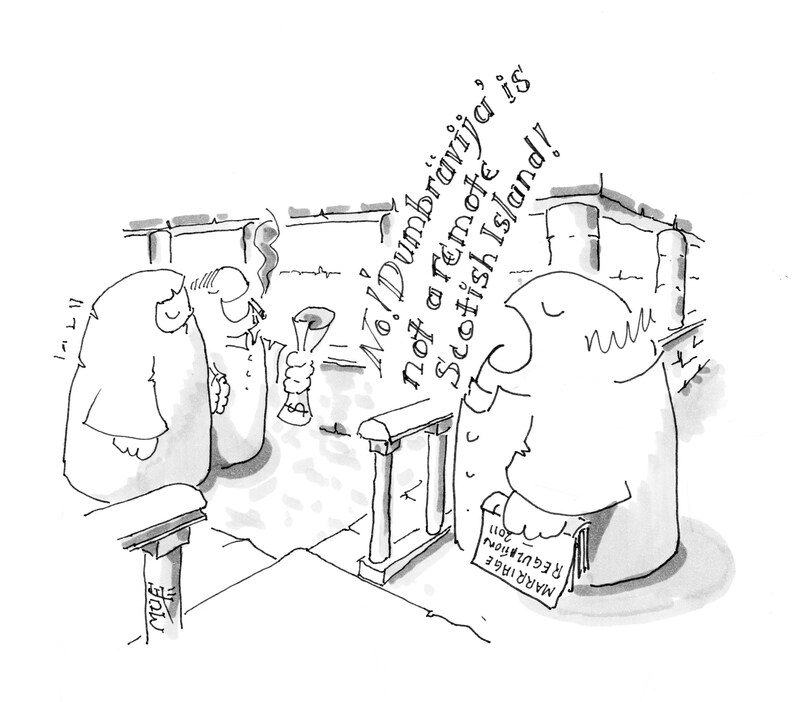 The regulations surrounding marriage have been in our news and blogosphere recently courtesy of the Churchmouse. The existing rules, as exercised in my patch of the Diocese of Winchester have also filled a significant chunk on my ‘ministry’ during our vacancy. So today, when I noticed MUF had posted his own excellent cartoon on the subject, I thought I’d round up a few of the things I’ve learnt and note them down, as well as reflect a bit on all the admin involved. Admin. Something I know I’m good with but prone to taking your eye off the ministerial ball. The important thing is probably to hold God in the conversation spaces (whether electronic, phone or personal) that exist around the various things that need doing to get a couple married – something I know I’ve tended to lose sight of in the endless round of ‘sorting out’ the little difficulties that come up. God, I’m afraid has often not got much of a mention. The Diocesan Registrar’s Office, a wonderfully helpful and responsive resource we share with Salisbury Diocese, has got lots of mention. I’ve possibly turned to them more often that to God. Sad, but necessarily true. I’m not a vicar, not ordained, and haven’t therefore been to ‘vicar school’. However, from working with our neighbouring vicar (who is also our Surrogate – someone who acts on behalf of the Bishop with regard to swearing affidavits for Common Licenses), I’m not sure how much of the legal stuff they teach at ‘vicar school’. 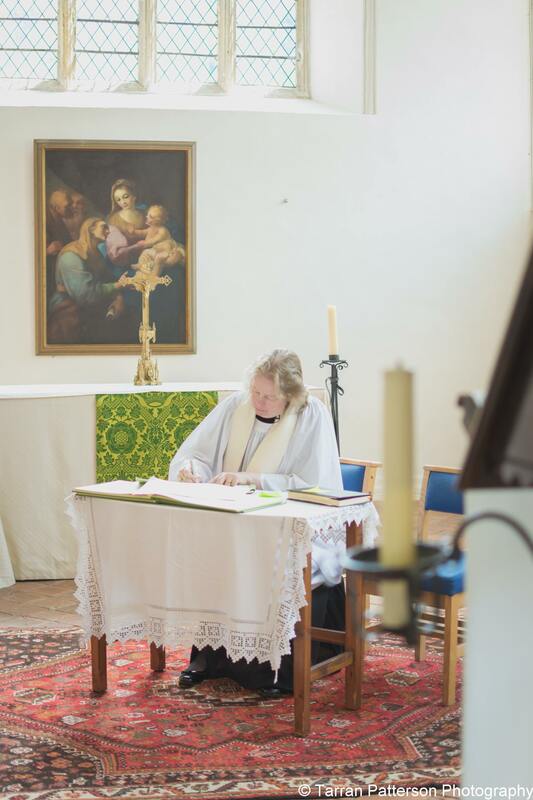 If a training incumbent hasn’t had certain experiences of a ‘wedding nature’ then they simply don’t know where problems might occur, and therefore can’t teach their curates/ordinands/admin support what needs to be understood. Anyone getting married in the CofE who lives in Scotland will need to marry under a Common License because the Scottish legal system doesn’t understand or use the banns system. this one caught us out, but we’re sorted in time for the couple’s big day. Down here in the south I don’t suppose it is common to get a couple coming all this way to marry under a Qualifying Connection! The Qualifying Connection (or is it only the fact there is one?) must be written in Banns of Marriage book when they are read, even if it is not read out. 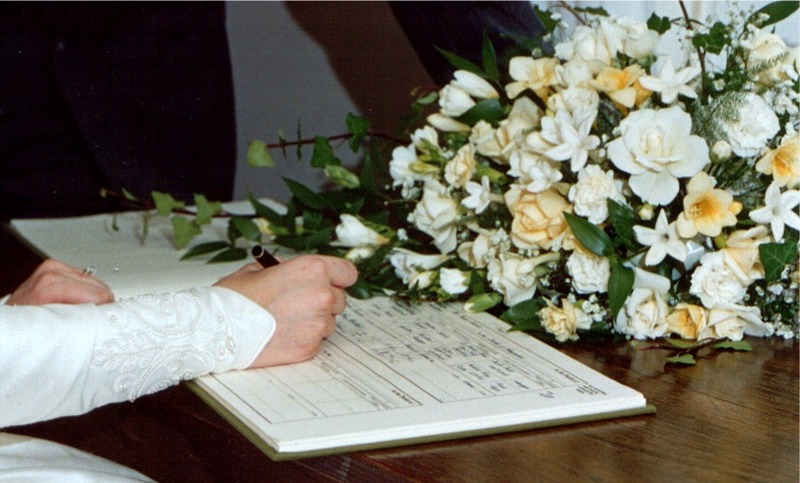 This one caught me out – we haven’t had as many weddings in recent years and our Banns of Marriage book pre-dates the Marriage Measure. Banns of Marriage must be read in a ‘main service’ in a ‘consecrated church’, and therefore can’t (only) be read in the school hall of the planted congregation at which a couple are known and in which they came to faith, nor in the 8am congregation at which a parent regularly worships! Now here’s a question. Who can read Banns of Marriage? Some clergy I’ve known let any service leader (ordained, licensed laity or simply with local responsibility) read the Banns at the appropriate part of the service. Yes, at the beginning of our vacancy I was told it could only be an authorised person (priest, read or churchwarden). Now, I’ve recently been told it doesn’t matter! Which takes me back to the beginning and my comments about admin. We’re a big parish, serving a community of approximately 14,000 with only one priest (when they arrive). We have no SSMs. We have one retired priest, with a reducing role in Sunday ministry due to ill-health. Yet we have 5 active Sunday congregations. One priest is not going to know all these rules and regulations they might need to know for the various scenarios of parish life. Most won’t even have the time to ask the Diocesan Registrar the answer to the bits they know they don’t know, and exchange the endless emails that are involved with calming the understandably confused nerves of your average bride and groom who are totally bemused by all this! Some parishes don’t have an administrator, or don’t have some dafty (like me) who has taken a sad interest in the whole thing. All this constant contact with couples does indeed build useful relationships, but I’m not sure that it’s really sharing the Gospel or God’s “Big Love”!! Nor is it helping to grow marriage ministry through our parish churches! There may be advantages to the Church in taking the administrative elements out of the Church and putt them into the common framework. Surely it is more important to place our focus on God’s role in the life of the couples that we as ministers are drawn to have dealings with, and the sacramental nature of the wedding and marriage itself? The ‘advantage’ Mouse speaks of must surely be not only the appropriate application on a case by case basis of the laws and regulations that are obviously necessary. Perhaps more importantly to the church’s mission, is the advantage of the continued sanity of our clergy and the space need for God’s “Big Love” to be recognised and responded to!